Six different views of the finger, which was found at the Al Wusta site in Saudi Arabia. 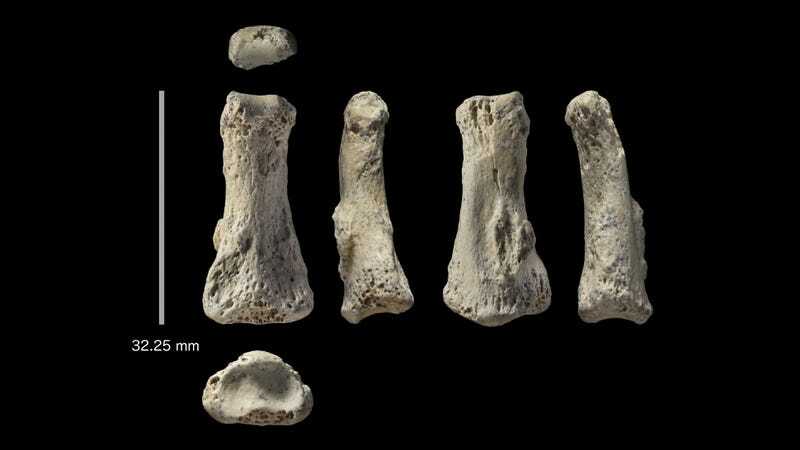 It’s just a lone, boney middle finger, but the scientists who found it say it’s the oldest directly dated fossil of our species to ever be found outside of Africa and the Levant, a region that today comprises Israel, Syria, Lebanon, and Jordan. But the new discovery is not without its critics, who say older evidence of human habitation outside of this region exists elsewhere, and that the finger might not even be human. In 2016, Iyad Zalmout, a scientist with the Saudi Geological Survey, was participating in the Al Wusta archaeological dig in the Nefud Desert, the former site of an ancient freshwater lake in what is now the barren Arabian desert, when he decided to go for a stroll. The excavations at the Al Wusta site, Saudi Arabia. The ancient lake bed (shown in white) is surrounded by sand dunes of the Nefud Desert. Two years prior, archaeologists had discovered the site, finding fossilized animal bones and troves of stone tools—tantalizing clues that hinted at former human occupation. While out for his walk, and in a complete moment of serendipity, Zalmout—a trained paleontologist—noticed a single, skeletal finger joint just lying in the sand. Instantly recognizing it as human, he hurriedly grabbed the attention of the project leaders, Huw Groucutt from the University of Oxford and Michael Petraglia from the Max Planck Institute for the Science of Human History. Stunned, Groucutt and Petraglia took the bone back to their hotel to analyze it further. With anatomy not being their strong suit, the archaeologists scoured the internet, comparing it to the fingers of Neanderthals and other so-called “archaic” humans. From there, the finger traveled to the University of Cambridge, where specialists made 3D scans of it, comparing it to bones of various archaic humans and nonhuman primates. Like Zalmout, the Cambridge researchers concluded that the fossil—a 3.2 centimeter-long adult middle finger—belonged to Homo sapiens. The finger, along with other samples found at the Al Wusta site, then traveled to the Australian National University in Canberra where scientists used several dating techniques to age the specimen—including uranium series dating, in which a laser pokes microscopic holes into the fossil to measure the ratio between traces of radioactive elements. The finger, the Australian researchers concluded, was 88,000 years old. The results of this study were published today in Nature Ecology & Evolution. That makes it the oldest directly dated fossil of Homo sapiens to be found outside of Africa and the Levant—the term “directly dated” being of crucial importance. Ancient human-like fossils and artifacts have been found elsewhere in east Asia and Australia, along with the remarkable—but highly contentious—discovery of 120,000-year-old human fossils in China. But in these cases, the human origin of the fossils isn’t entirely clear, and the items were indirectly dated, meaning the deposits enclosing the fossil or artifacts were dated, and not the fossil itself. That anatomically modern humans were living in Saudi Arabia some 88,000 years ago is actually quite unsurprising. A jaw fossil found in Israel’s Misilya Cave, just a few hundred miles to the north, suggests ancient Homo sapiens were living in the Levant as long as 175,000 years ago, and possibly as long as 200,000 years ago. But what makes this new study exciting is that it’s the first direct evidence of early modern humans venturing outside of Africa and the Levant. What’s more, it affirms that migrations into Eurasia were more expansive than previously thought. Traditionally, scientists figured modern humans migrated out of Africa in a single wave some 50,000 to 70,000 years ago, moving along the coast and subsisting off marine resources. But the discovery of this finger bone suggests humans were moving about 20,000 to 25,000 years earlier than assumed. This is how the Al Wusta area looks today, but 88,000 years ago, the region contained grasslands, lakes, and rivers. Interestingly, the fossil was discovered in the harsh Arabian desert, but back then the region was home to a very favorable environment, featuring humid and monsoonal weather conditions, extensive grasslands, rushing rivers, and sprawling lakes. In addition to the human finger, the researchers found fossilized traces of hippos and freshwater snails. For these early humans, the Levant and the Arabian region was merely an extension of Africa, with climate change and dynamic environmental conditions pushing and pulling them away from their continent of origin. As prey animals migrated, so too did these early humans. By adapting to this semi-arid grasslands in the Arabian interior, these early humans were setting the stage for a larger, more global expansion, according to the researchers. As for the finger, the researchers don’t know the former owner’s gender or age, nor which hand it came from, but it does exhibit signs of manual stress. A lump in the bone has been interpreted as an injury caused by repetitive physical activity, perhaps from knapping stones into tools. Katerina Harvati, head of paleoanthropology at the Senckenberg Center for Human Evolution and Paleoenvironment, likes the new study, saying the authors did all they could to analyze the finger bone. Anthropologist Rolf Quam from Binghamton University (SUNY) agrees that the authors performed a thorough analysis of the fossil, but without ancient DNA, he’s doubtful we can definitively say that this fossil belongs to a Homo sapiens individual. Jean-Jacques Hublin, director of the Department of Human Evolution at the Max Planck Institute for Evolutionary Anthropology, disagrees, saying the finger appears to be anatomically human, and that it does not contain any features usually found in Neanderthals. Hublin’s issue with the analysis, however, has to do with the uranium series technique, a dating method that he believes “is not very reliable on bone.” The dating of the surrounding deposits, which have been timestamped to 90,000 years ago, provide a “safer chronological position” in his opinion. Mina Weinstein-Evron, an archaeologist from the University of Haifa, and Israel Hershkovitz, an archaeologist at Tel Aviv University, are taking issue with the fact that the new finger was found on the desert surface, and not intermixed within a “clear archaeological context.” The dating of the specimen, therefore, is as reliable as the ones performed on the East Asian hominins, they said. “The East Asian hominin fossils were dated indirectly, based on calcite layers on the cave walls, as the caves were looted long ago by local farmers for fertilization of the fields. This does not mean the dates are inaccurate,” Weinstein-Evron and Hershkovitz told Gizmodo in a joint statement. “In any case, even if it the oldest so-far dated, it does not follow that human groups passed through Arabia either from Africa to the Levant or from the Levant to the east, as may be implied. The available data and geographical constraints seem to better support a northern route.” The Al Wusta site, they argue, may not have been the stepping stone to the globe that the authors are claiming it is. Weinstein-Evron and Hershkovitz also point out that the discovery doesn’t prove that the area around the ancient lake was colonized, saying people roamed into these areas occasionally when the climate was favorable. The finger is probably from an early modern human, but the discovery doesn’t change the evolutionary picture as we know it today, they said.